Heartbeat of Morrow County was the recipient of a very generous group that gathered for a Motor Coach rally at The Cardinal Center in Marengo the week of May 10th. The Monaco America Motor Coach Association held a ladies tea the afternoon of May 12th in the event center, and the women showered Heartbeat with piles of handmade baby quilts, afghans, baby hats, and lots of other items that will be used in the Boutique to help young families get a good start with their children! Seventy-one campers attended the event from several states across the country from coast to coast! In addition to their generous gifts, they also took up a collection and had an Ohio Basket Raffle with all proceeds going to the charity. The Ohio Basket was full of goodies that are made in Ohio as well as a few OSU items, of course! That evening, when their husbands had a guys’ event, they also took up a collection and made a very generous donation. The refreshment committee served all Ohio themed goodies including cheeses from Holmes County, tea sandwiches, and “Buckeyes” candy for dessert. Door prizes were also items from around the State of Ohio. 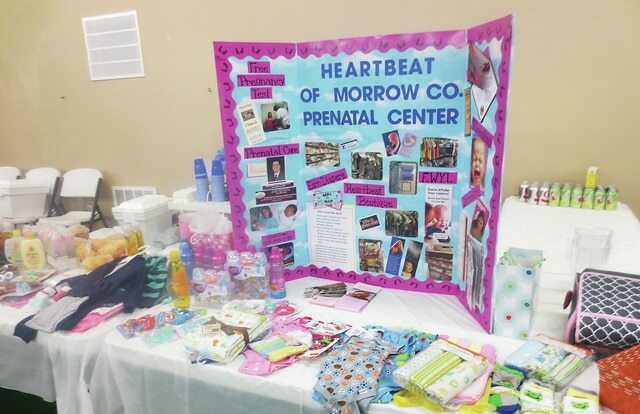 During the program, Faith Jagger, a volunteer and board member from Heartbeat of Morrow told about the ministry of the Crisis Pregnancy & New Life Prenatal Center in our county and thanked the ladies for their many gifts! Carol Granat, coordinator of the Ladies Tea & longtime member of the group explained that the group has two camping rallies each year, one in the spring and one in the fall. When they go to an area, they find out what some of the charities are in the area, and choose one to support. For their next rally that will be in Shawnee, Oklahoma and they have chosen to support a women’s shelter and a children’s recreation center. Call 419-947-7730 for more information about Heartbeat of Morrow County or visit our web page at www.heartbeatofmorrowcounty.com or “like” us on Facebook. Again, thank you to Carol Granat for organizing the event and the Monaco America Motor Coach Association!